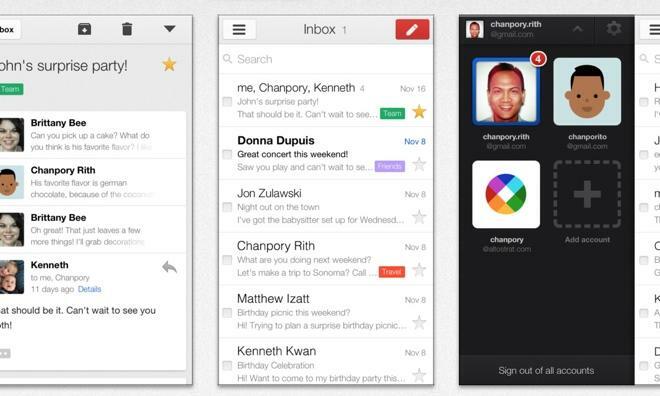 The new Gmail for iOS is now available as a free download in the App Store. Version 2.3.14159 is 13.7 megabytes, and requires iOS 5.0 or later. The new notification options promise to alert users to all messages, only important messages, or none at all on an account-specific basis. Users can customize these settings from the in-app settings page. And the new inbox, when enabled, groups mail into categories, allowing users to see what's new at a glance and more easily decide which emails to read. The updated application shows primary mail first, while emails in other categories can be viewed by opening the menu. Users can configure this feature by accessing gmail.com on a traditional computer. The updated Gmail inbox layout was brought to iOS devices via the Safari Web browser last week. The new tabbed interface was first unveiled by Google at its annual developers I/O conference last month.